In the middle of Bass Strait, on the northwestern tip of remote King Island, sits Australia’s tallest lighthouse and one of the world’s most spectacular golf sites. 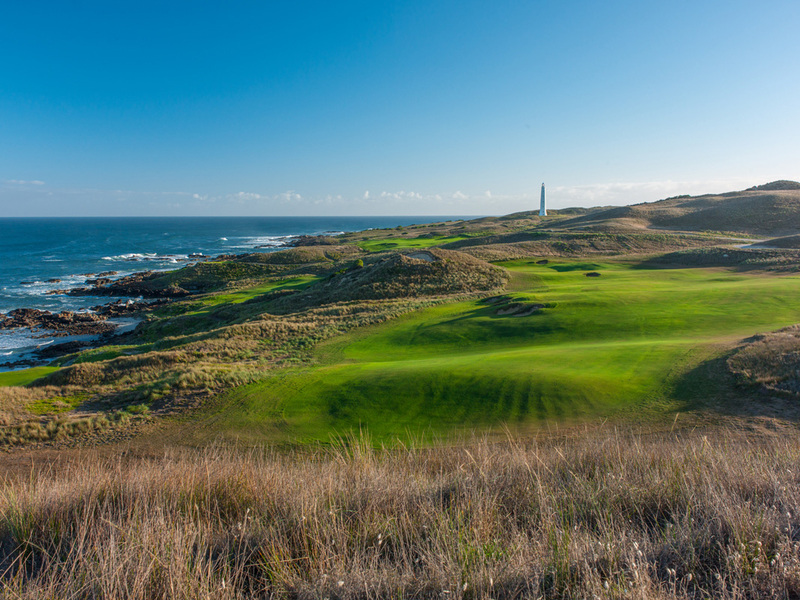 Cape Wickham Links was designed by Mike DeVries and Darius Oliver, and opened for public play in late 2015. 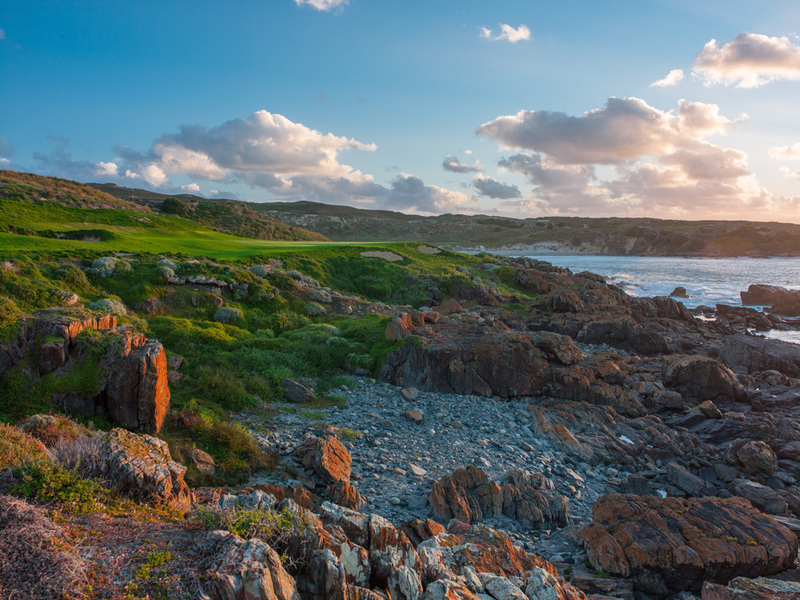 If not the most beautiful place to golf in the world, Cape Wickham is certainly on a very short list. King Island is situated midway between the Australian and Tasmanian mainlands, and renowned for its delicious cheeses, beef and seafood. It also has a fascinating maritime history with a number of notorious shipwrecks during the early 19th century leading to the construction of both the Cape Wickham and Currie lighthouses. Measuring in excess of 150 feet, the Cape Wickham lighthouse was first operational in 1861. In the shadows of this epic structure is an irregularly shaped shoreline and towering sand dune system, seemingly left on earth for the purpose of great golf. 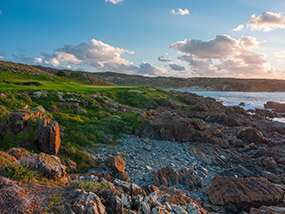 This really is the “kitchen sink” site of coastal golf, with everything from a dramatic promontory, sandy white beach and cove, enormous dune corridors and holes set right down on the rocky coastline thrown into the mix. The lighthouse itself stands sentinel over a dramatic closing stretch and is visible from many parts of the golf course, most memorably as an aiming point for those standing on the 4th tee. While hard to imagine a more spectacular canvas for our game, it’s equally difficult to conceive of a routing plan that incorporates as much ocean or as much coastal variety as this one. Holes are essentially arranged into three main sections; the first five are laid across a western headland known to the locals as Cape Farewell and followed by a central section through the more complex and intricate southern dunes, which boast tremendous movement and character. The final five-hole lighthouse loop extends to the north of the elevated clubhouse and concludes with a famous par four along the Victoria Cove beach. All told, there are eight holes at Cape Wickham that run along the coast and another couple with greens that appear directly on the water. Every hole has a panoramic ocean view. It’s hard to think of any course, anywhere, with quite as many thrills. Pebble Beach is the most obvious comparison because of its irregular coastline and mix of beach and bluffs, but Wickham’s inland holes have far more drama and character than Pebble’s, and the site itself is much more rugged. The fun begins with about as exhilarating an opening tee shot as one could ever want. With big Bass Strait views and water lurking down the right, the 1st plays from atop a central ridge onto the Cape Farewell promontory and rewards those able to drive bravely down the dangerous side. Equally dramatic, the 2nd drops from an upper plateau down along a lower seaside ledge, toward a green set spectacularly at the western tip of the Cape, near a collection of rocks frequently populated by visiting seals. The 3rd is then a longish par three played toward a pair of offshore islands, its large green protected by the ocean on one side and a generous bailout area on the other. Above - waves crash beyond the par four 2nd green at Cape Wickham. Perhaps the most remarkable aspect of the opening sequence is not how good the holes are individually, but how quickly they can appear overwhelmed by the rest of the golf. The finishing run is outrageously scenic, and in between are some glorious inland holes and a four-hole stretch, from the 9th through 12th, that almost defies description. That stretch starts with a multiroute/multioption par five that tumbles and twists toward the distant ocean and an apparently pimple green set on a small ledge between dunes and beyond a scruffy valley. Each of the par fives at Wickham head in a different direction, and the 9th is rare for the fact that it actually plays easier into the wind, when less tempting. Above - the extraordinarily spectacular par five 9th hole. Next is the 10th, an exciting short par four that drops further down a dune valley toward the coastline and features an exaggerated half-pipe fairway and innovative green complex. Long or short shots into either the upper right bowl or lower left swale here are great fun. The short 11th is then set right down on the rocks and played to a green nestled on a small peninsula jutting into the sea. It’s followed by a driveable par four, with a narrowing fairway and a dangerously contoured clifftop target perched beyond a windblown cave. glamour of the surfing sections. The final inland hole, the 14th, is a cracking downhill par four that doglegs around a string of bunkers toward a natural punchbowl green at the base of an enormous sand hill. The remaining holes hug the northern coastline, starting with the long par five 15th, which gets nearest the lighthouse and ends with a superb green pushed directly against the rocks. 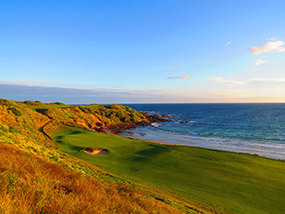 From here the golfer turns back for home and experiences three breathtaking holes set directly along the rugged shoreline. With the Victoria Cove beach in play from the tee and the fairway, the curving par four 18th is a particular treat and probably the most strategically sound par four on the property. Above - looking back toward the 16th green, set against the rocks. While the greatness of a good many holes is apparent at first glance here, others are more mysterious and take a little time to understand and appreciate. The 4th and 5th are perfect examples, where wind changes the character and playing strategy of each, and either turns teddy bears into brutes or vice versa. Other less obviously glamorous standouts include the reachable par five 6th and gorgeous short 7th, its narrow green partly obscured by a large bump and pressed against a pristine sandstone escarpment. The somewhat barren appearance of the dunes between this green and the 8th tees contrast nicely with the denser native grasses elsewhere through the interior, and the array of flowering succulents and low-growing bushes found along the shoreline. This diversity of vegetation is a genuine attraction of the area. Beyond the many natural bounties on display at Wickham, the most pleasing aspects of this course are its walkability, playability and variety. The routing flows effortlessly between holes and the designers sensibly kept their fairways wide enough to ensure it remained an enjoyable test under all conditions. The expansive chipping swales around greens are a particular feature as is the bunkering, used sparingly nearer the targets to allow for all sorts of creative approach and recovery options. 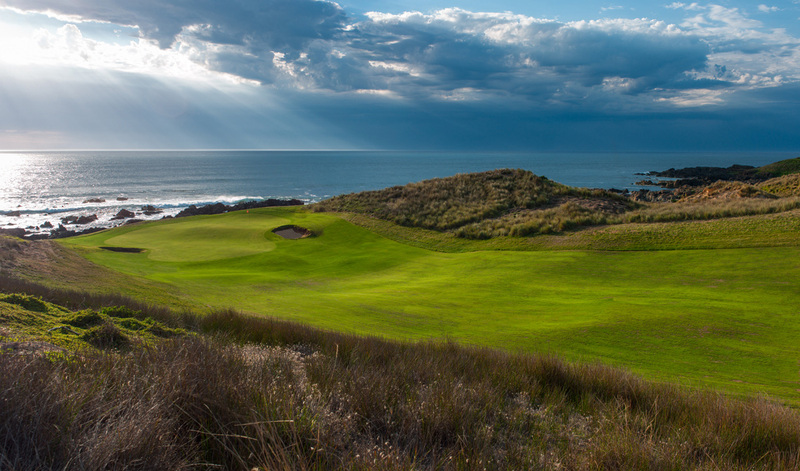 King Island isn’t the easiest place to get to, but those of us involved in this project always felt that if the course was good enough then golfers would make the effort. 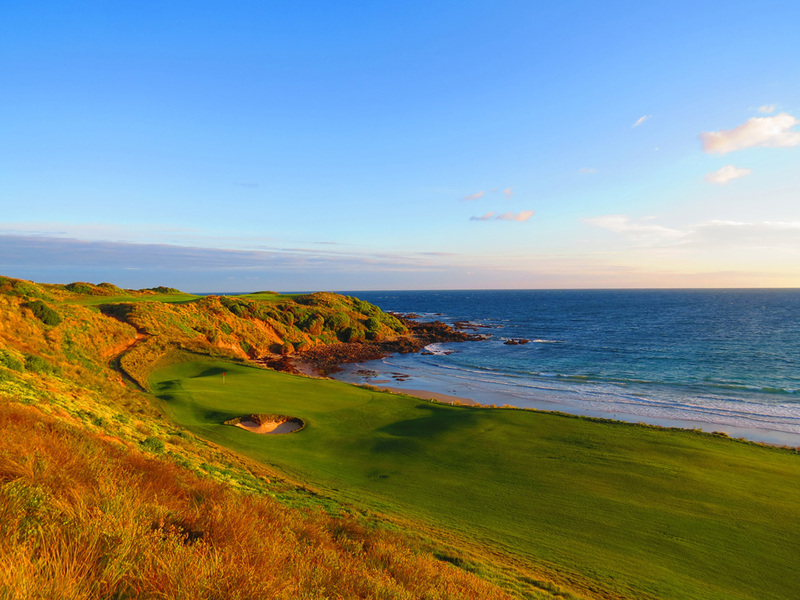 It isn’t the longest or hardest course you will play, but if we’ve done our job properly then Cape Wickham is sure to be one of the most unforgettable. 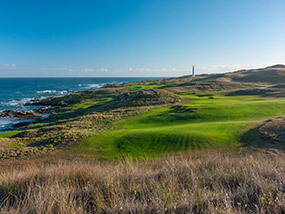 Above - Cape Wickham's beachside par four finishing hole. Bookings are NOW available for Cape Wickham. CLICK HERE FOR INFORMATION.